Eco Glass Filter Media (EGFM) is the new environmentally friendly and cost effective filter media that provides a viable alternative to sand. Made from recycled glass, it doesn't involve intrusive mining and the use of scarce resources. EGFM has the green credentials, and with its superior performance is also cost effective against sand. Saving on backwashing and the resultant water, energy and chemical treatment costs. Its angular to sub-angular particle shape and bound silica content provides a 30% improvement in turbidity removal over silica sand. It generally removes finer particles from water than the equivalent grade of silica sand. Its non porous composition means it is less likely to 'clump' or channel than silica sand. With superior permeability, back washes take less time, saving water/sewer charges, and energy and chemical treatment costs. 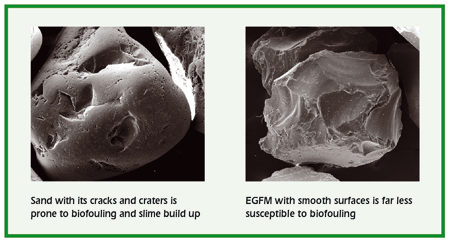 It is less susceptible to bio-fouling as, unlike silica sand EGFM particles have a smoother surface, so bacteria cannot get trapped in any cracks or flaws, which means less remedial action and again less chemical treatment to destroy pollutants. It is less dense than sand, requiring 15% less media to fill the equivalent filter. It therefore has a longer life span and may not need changing even when the filters are due for refurbishment.